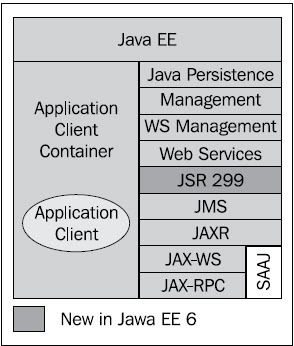 The JEE specification outlines four types of containers in java, as shown in the following diagram. These containers form the guidelines of the services, which are to be provided by a JEE application server as implemented by a software vendor like IBM, Oracle. 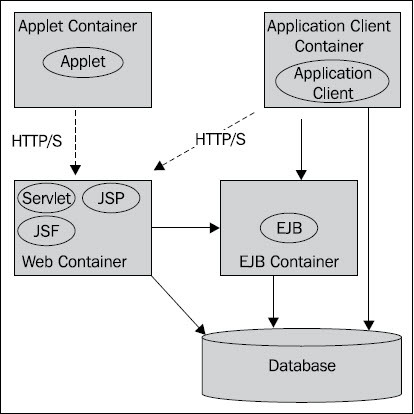 The Applet container manages Java applets. An Applet is a Java program that can be embedded into a web page. Most web pages are rendered using HTML/XMLbased technology. By embedding the tags <APPLET> and </APPLET> a browser will load a Java applet, which can use the Java AWT/Swing interface APIs, allowing a traditional client-like application to run within the browser. The Applet container manages the execution of the applet, and contains the web browser.